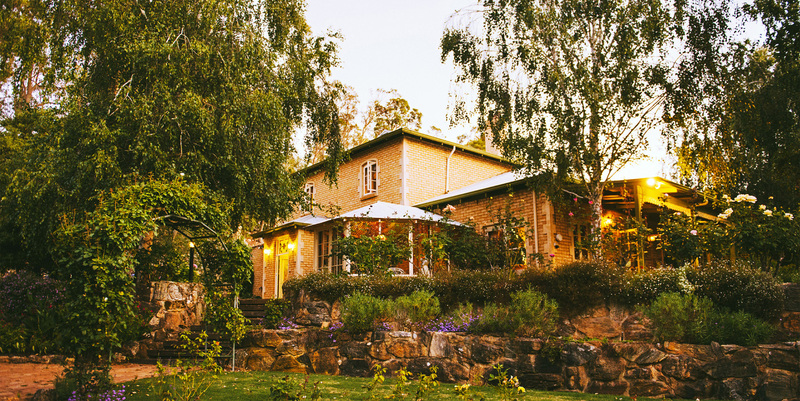 Holberry House overlooks four acres of gardens and parkland in the centre of Nannup, in Western Australia’s south west. It provides the peace and beauty of a country retreat, within walking distance of shops, cafes and the historic pub, as well as the Blackwood River and many bush walk trails. Though built in the late 1980s, Holberry House was inspired by the classic, two-storey English manor. Its seven very comfortable guest rooms, all upstairs, are decorated in romantic country style, enhanced by antiques and collectibles from the owners’ travels. All rooms have television, and one is equipped with a spa. Enjoy our central Nannup spa accommodation. Downstairs, the guest lounge harks back to travellers’ lodges of the 19th Century, with its open fire, stone chimney and Chesterfield couch. At the other end of the lounge, a reading nook offers comfy chairs, books, magazines and games. Perched near the top of the hill, and surrounded by tall trees, is the large swimming pool, with its tranquil gazebo. Nearby attractions include art and craft shops, woodturning studios, chestnut and marron farms, Barrabup Pool and Cambray Cheese Factory. Via Mowen Road the wonderful wineries of Margaret River are just 40 minutes drive away.